What is a USB mic and why do you need one? A USB microphone has all of the components of a traditional microphone. It differs from a traditional microphone in that it also has an onboard preamp and an analog-to-digital (A/D) converter. This eliminates the need to connect it to a mixer or external mic preamp. You just plug it directly into the computer and the A/D converter automatically changes the mic’s output from analog to digital for recording. The USB option also has an easy plug-and-play function. No extra equipment is needed. They have convenient connectivity since you can use them along with your computer, laptop, or tablet for recording. This offers flexibility and allows you to record wherever you want instead of being tied to one studio. 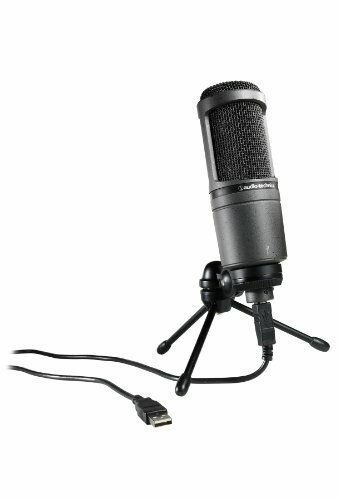 When would you use a USB condenser mic? They are great for podcasting, recording vocals, other music, interviews, and voiceovers. Vloggers love this option since they have much better audio quality than is provided by the built-in mics in laptops and computers. They are super easy to use so you won’t need to spend a lot of time trying to figure out a complicated setup. Another benefit of USB condenser mics is that they are much more affordable than other types of microphones while still providing a high-quality sound. This is what has made them hugely popular. This sleek mic came in easily as number one for the best USB microphone. Compatible with Mac and Windows computers, the Yeti produces a clear, crisp sound. Equipped with multiple pattern selections, you can choose to set it at either cardioid, bidirectional (picks up sound in the front and back), stereo (uses both left and right channels) or omnidirectional. This allows you to use it in a variety of different situations including: vocal recording, recording musical instruments, podcasting, voiceovers, interviews, field recordings, and conference calls. Whichever pattern selection you choose, you are guaranteed to hear a natural sound. The Yeti takes the capability of several microphones, and condenses it down to one affordable option. This saves you a lot of money. 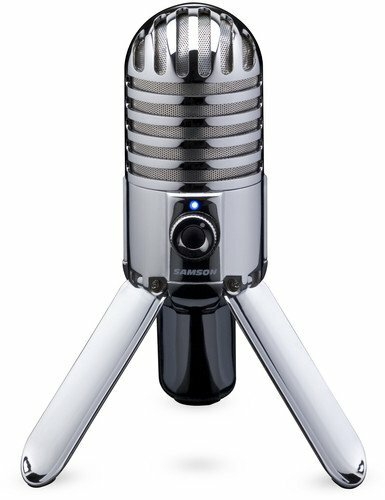 Featuring Blue Microphone’s tri-capsule technology, the Yeti can record in almost any situation and produce pristine, studio-quality recordings. There are easy-to-use controls for headphone volume, pattern selection, instant mute, and microphone gain so that you can use the microphone straight out of the box. You won’t have to go through a long list of complicated instructions to learn how to use it. The several controls also allow you to be completely in charge of every level of the recording process. When you see the need to adjust, you can do so immediately to produce the best recording. Maybe you start experiencing some distortion, you can simply use the gain control to adjust the microphone’s sensitivity. The Blue Yeti comes with a 3.5mm headphone jack so that you can listen to what you are recording without any latency delays. Use a control on the front of the microphone to adjust the volume of your headphones. Whenever you want to take a break during recording, hit the ‘instant mute’ button. Featuring a metal grill and shiny frame, the Yeti gives a retro feel that will pair perfectly with your computer or laptop. It is built on a hinge so you can adjust the microphone to angle towards wherever the sound source is, which greatly improves sound quality. Once you have it just the way you want it, you can use the set screws to secure it in place. The solid metal stand raises the mic to mouth level for more comfortable recording. It is strong and durable to last you a long time. Also designed to be portable, it can be folded down or removed from its base. The Yeti has received the THX certification for excelling when it comes to frequency response and signal-to-noise ratio. The Yeti has a frequency response of 20Hz-20kHz, a sample rate of 48kHZ, and a bit rate of 16. Included in the purchase is an adjustable stand, USB cable, instructions, and a 2-year limited warranty. It come in 4 different colors: white, silver, platinum, and black. 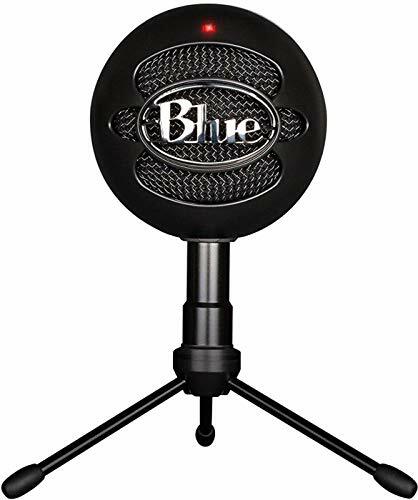 Featuring three different pattern modes, the Blue Snowball provides versatile recording. The cardioid mode is designed to record sound sources directly in front of the mic. This mode is good to use to record podcasts, sung vocals, and other voice work. The second setting is the cardioid mode with -10 dB PAD. This is the same as cardioid mode, but it has a -10 dB attenuation that helps you to capture louder sounds at higher fidelity. The third mode is omnidirectional mode which is great to use when you want to capture the whole experience of being in a certain setting. You can use the omnidirectional mode to record live band performances. 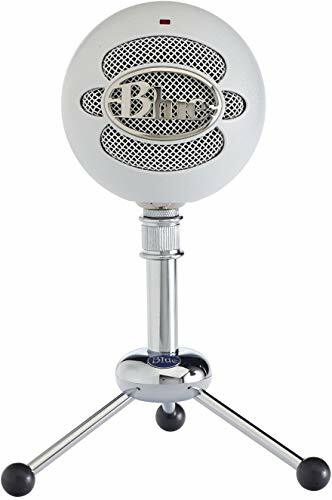 Equipped with Blue Microphone’s award winning dual capsule technology, the Snowball is guaranteed to produce pristine recordings free of distortion and feedback. It is the perfect addition to your computer if you want to record music, podcasts, live chat, and more.. It is compatible with Mac OS X (10.4.11 or higher), as well as Windows 8, Windows 7, Windows Vista, and Windows XP. Requiring no extra drivers, it is ready to use straight out of the box. All you have to do is plug it in to start recording. Once it is attached to your computer, a red light will illuminate to tell you it is successfully connected. 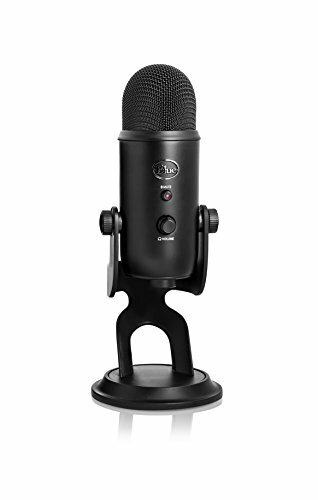 The Snowball comes with an adjustable tripod that allows you to properly position the mic in relation to the sound source which greatly improves sound quality. It comes in 6 colors: white, grey, black, blue, green, and orange so that you can customize your setup. The sleek, retro design will remind you of the look of microphones from back in the day. With a sample rate of 44.1 kHz/16-bit, the Snowball rivals other USB mics that are much more expensive. It is easily one of the best USB condenser mics out there right now. Super lightweight and with a stylish design, it is the perfect companion for your computer or laptop. It is compact and easily portable. When it is powered on, the LED indicator will light up. The Snowball is available in 3 classic colors: black, white, and brushed aluminum. Unlike the Blue Yeti, the Snowball does not have a headphone jack for listening to the recording in real time. But if that is something that is not important to you, the Snowball will work great for you. 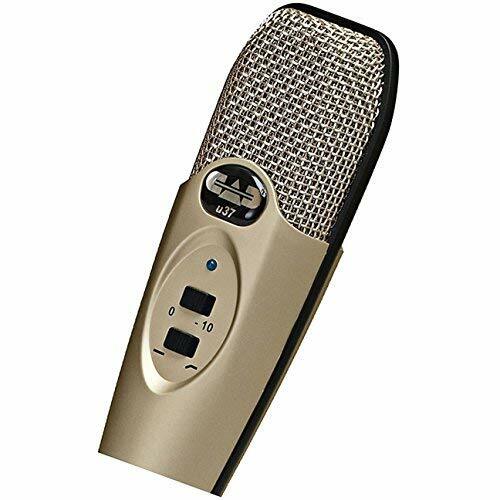 Since it is a monophonic microphone, it does well at recording single audio sources like a voice or instrument. But the 3 different settings offer versatility to your recording. Offering a much more superior audio quality than your computer’s built-in microphone, the Snowball iCE is the perfect addition for your computer-based audio recordings. It greatly improves the audio quality when you want to use Skype, Twitch, and FaceTime. It is even Skype certified for guaranteed performance. The Snowball iCE allows you make crystal clear recordings for your YouTube videos, podcasts, and narrations for your home movies. You can even record vocals, instruments, and entire bands with awesome sound quality. Featuring an easy-to-use plug and play system, you don’t need to install any drivers to get it to work with you computer. Just plug it in and you can start using it. It works with Windows 8, Windows 7, Windows Vista, XP Home Edition or XP Professional and Mac OSX 10.4.6 or higher. It needs at least 64MB RAM to work. If you have Apple’s Lightning to USB adapter or the USB to 30-pin adapter, you can even connect the mic to your iPhone or iPad. Designed to work with any software on any computer, the Snowball iCE makes it easier for you to complete your projects. It is available in white or black to pair well with whatever computer you have. For setup, all you have to do is mount the microphone on the included adjustable desktop stand and plug the USB cable into your Mac or PC and you are ready to go. You can also mount it to a traditional mic stand when you want to. Once connected to your computer, the red light on the front of the mic will light up. The USB cord is 6 feet long to allow for a variety of mic placement options. Featuring a condenser mic capsule, the Snowball iCE delivers the kind rich audio that you usually find in studio recordings. To control the volume on the mic, go to the control panel on your computer and open “sound” and adjust. The swivel design allows you to position the microphone just how you need it to be for the best possible recording. You can point it in almost any direction. If you are on a budget, the Snowball iCE is one of the best cheap USB microphones on the market. The cardioid polar pattern makes the mic pick up audio from the front and block out sounds from the rear which is ideal for isolating a certain sound. Whatever you want to record should be close to the front of the microphone. It features a bit depth of 16-bits and a sample rate of 44.1kHz. It has a frequency range of 40 Hz to 18kHz. 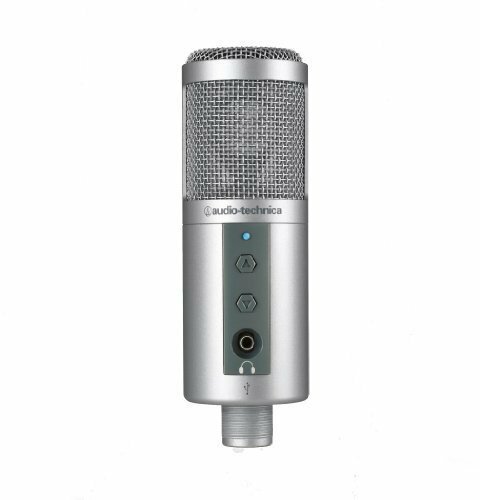 With over 80 years of experience in producing high quality professional audio equipment, CAD has done it again with the U37 studio condenser microphone. Designed to bring studio quality audio to your gaming, social media or home studio, it is the perfect companion for your computer. 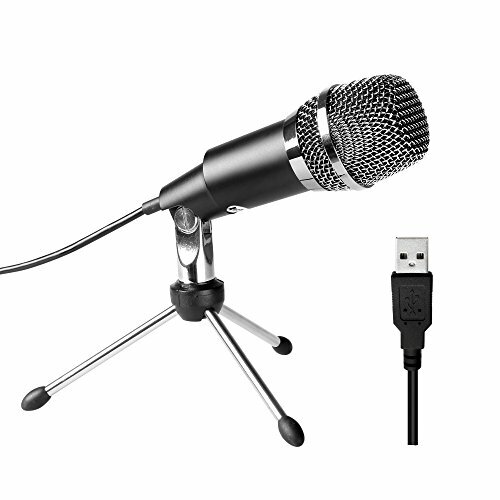 It is one of the best USB condenser mics as well as one of the best cheap USB microphones. The cardioid polar pattern minimizes background noise and isolates the main source of sound. This makes it perfect to record singing, speech, and instruments. The extended frequency response maximizes its performance. A large diaphragm helps produce warm, rich sounds. Large diaphragm mics are often preferred for vocal performances and speeches. Featuring a -10dB overload protection switch, distortion from loud sound sources is minimized greatly. For example, for loud voices or percussion instruments, you can put the switch in the “-10” position. For normal voices and string instruments, the “0” position is best. A convenient bass-reduction switch reduces room noise to isolate the sound source you want to record. It reduces the pickup of deep bass sounds. For most cases, the “normal bass” mode is best. However, if you want to remove wind noises, ventilation noise, or decrease the low frequencies in a recording, it is best to but the switch in the “bass reduction” position. The CAD U37 has a side-address design which many people like to use for broadcasts, TV, and at recording studios. The U37 is super simple to use, just plug it into your computer’s USB port and select it as your input in software settings, and you are ready to start making some great recordings. When it is plugged in, the blue light will illuminate. Included in the purchase is a tripod stand and 10 feet of USB cable for flexible mic placement. It is compatible with both Mac and Windows. For portability, the legs fold together and then the whole stand can be folded in half to make it easy to fit into your bag. Available in 8 different colors, you can pick the one that best suits your personality. It comes in: gray, black, orange, white, camouflage, red, champagne, and a red/white combo. It makes for a very attractive desktop piece. The metal grille has a nice double-layer design that you see on many expensive mics and enhances the durability of the mic. The U37 requires no preamp, mixer, or phantom power supply, saving you a ton of money. However, a budget-friendly price does not mean reduced quality as the U37 delivers warm, noise-free recordings. It offers you complete control of the recording and you can use the controls to customize the mic to perform its best in whatever situation you are in. It is for sure one of the best USB condenser mics out there right now. If you are looking for a super portable option, the Samson Go Mic is a great choice. Compact and light, you can easily take it anywhere with you. You can clip it right onto your laptop or let it sit on your desk without it taking up a lot of space. It is ideal to use for recording music, podcasting, and field recording. Podcasting especially is growing in popularity as are the standards of audio quality that go along with it. The Go Mic meets the need for a high-quality recording and records directly into your preferred software program. If you frequently use online communication, like Skype, iChat, or VolP, the Go Mic provides excellent clarity. If you are engaged in an online business meeting, you can listen clearly without missing any crucial information. To set it up, just plug it into your Mac or Windows computer and start recording, no extra drivers needed. Featuring 2 different polar patterns, the Samson Go Mic guarantees you will get the best recording no matter what situation you are recording in. If you are a multimedia enthusiast, the Go Mic will also bring superior audio quality to your voiceover work. The quality of the audio will match perfectly with the professional quality of the video. The Go Mic is also perfect for voice recognition software, iChat, web casting, and Voice over Internet Protocol (VoIP). When recording a podcast, acoustic guitar, or vocals, the cardioid pattern works best since it focuses on capturing the sound in front of it. When you want to record the whole room or a band, the omnidirectional pattern works best to capture the ambience of the setting. You can also use the omnidirectional pattern when you are webcasting with a group or conducting an online meeting with multiple members in one location. 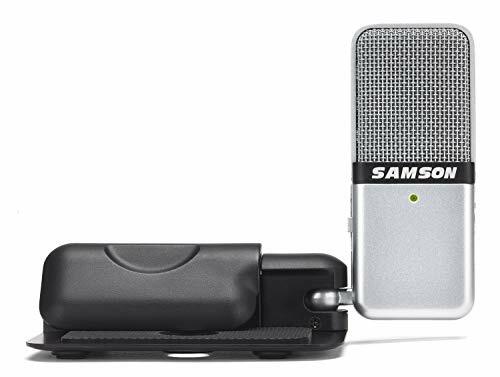 The Samson Go Mic has a frequency response of 20Hz-18kHz and a resolution of 16-bit/44.1kHz to produce a professional audio recording. One big advantage it has is that you can connect headphones to monitor the recording latency free. This gives you complete control over the recording so that you can make adjustments when necessary. There are no controls on the mic but you can adjust the volume through the recording software. The mic folds up and fits into an included storage pouch when not in use. It also comes with combined mount and storage clip which has a mic thread so that it can be screwed onto a traditional mic stand. Polar pattern. This refers to the pattern in which a microphone picks up sound. The kind you should choose depends on what you will be using the microphone for and what kind environment you will be in. There are 5 main types. Cardioid microphones. This type gets its name because of heart-shaped pattern in which it picks up music. Cardioid mics pick up all the sounds in front of them and block out all other sounds. This helps avoid picking up unwanted ambient sound. This makes them great to use for live performances, drum kits, karaoke, and many other environments. Omnidirectional microphones. Capturing sound from all directions, omnidirectional microphones provide a very natural sound. They are useful to use in studios, churches, and live recordings of multiple instruments. The downside of this type is that they don’t filter out unwanted noises so they are not useful in noisy areas. Figure-8 microphones. This type is similar to the omnidirectional except they do not pick up sound from the sides. They only capture sound from the front and back. They are ideal to use for stereo recording. You can also use them when you want to record 2 or more instruments. Shotgun microphones. Shaped like tubes, shotgun microphones do not pick up sound from the sides and have a longer pickup range from the front. This makes them great to use as suspended mics for recording singing groups. They are also used a lot in film and theatre. There are some things you should consider before making your purchase. This is an important thing to consider before making any purchase. Knowing your budget will help you to streamline your search, eliminating options that are outside of your price range. Fortunately, there are many budget-friendly options. If you want a more professional standard, the price will go up a bit. Check out our list of the top 10 picks to see some of the best cheap USB microphones. What will you be recording the most? Recording vocals and digital pianos is most conveniently done with condenser mics. To record louder sources like drums, basses, and guitars, you might want a dynamic mic. Usually however, condenser mics are the best choice for recording. If you will be recording in a semi- professional setting, make sure to get a mic that can be mounted on a stand. Alternatively, you can connect it to a desk stand and record sitting down. For podcasting or for participating in meetings, you may want to go for a smaller mic that you can clip onto your screen. What About Sample Rate And Bit Depth? These are some numbers you should pay attention to when looking into a USB condenser microphone. Sample rate is measured by kilohertz (kHz). A microphone needs to have at least a sample rate of 44.1 kHz which is the rate used on CDs and is also suitable for recording purposes. Bit depth tells you how many bits are in each sample. A bit depth of 16 is the minimum that your mic should have. Which Diaphragm Size Is The Best? The size of the diaphragm is also something to consider since it affects the way the mic picks up sound. Large diaphragm mics are more sensitive than small diaphragm mics and excel at picking up low frequencies. This makes them good to use for speaking. Small diaphragm mics pick up sounds of acoustic instruments and vocals best. Do You Need A Mic That Has A Headphone Input? Some of the best USB microphones have an input for headphones, some do not. The benefit of having that option is that you can monitor the recording in real-time. This allows you to make instant adjustments when something isn’t sounding right. Whether you want this option or not depends on what you will be using the mic for. If you will be recording vocals, bands, or videos, you may want this option. If you will be using the mic for things like Skype or gaming, this may not be so important to you. Any mic that has this option though, should have low latency to allow for the best monitoring. What Controls Do You Need? Mute control: This is useful when you want to cut off sound from the mic to take a break from recording. Monitor mix: For mics that allow for real-time monitoring, some will also have a volume control for the headphones so you can adjust it relative to previous recordings. ​Low-cut filter: This filters out unwanted low frequencies noises like stage noises. Finding the best USB microphone will help you to step up your recordings from standard to professional. They are easier to use and much more affordable than standard microphones. You don’t need a lot of expertise to use them. ​To find the best one for you, first have a budget clearly in mind. Fortunately, there are many budget-friendly options available. Decide which type of polar pattern will work best for what you want to record. Pay attention to sample rates and bit depths to make sure the mic has at least the minimum requirements. The size of the diaphragm you need will depend on what you will be recording.